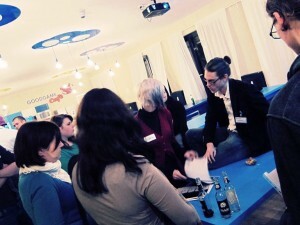 The first ever Art Night took place in our Goodgame Café in November. Students and other interested artists met there to get an insight into our art department. The aim of the event is both to offer a social platform for the participants and our artists and to provide information about career opportunities as an artist at Goodgame Studios. 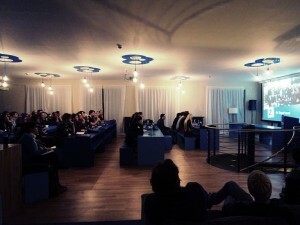 Around 80 people came to the evening and they were given a presentation about our company and the various artistic areas. The people in charge of each area discussed technical requirements, the kind of tasks they deal with and how their teams work together. Michael, our Head of Arts, concluded the presentation by giving a brief preview of what’s being worked on in our current games. Afterwards came the social part of the evening, where our artists and our guests enjoyed some informal conversations over some drinks and nibbles. Many used the time to seek out some artistic tips or to get feedback on their portfolios. Some even submitted job applications then and there. As a climax to the evening, the attendees were given a tour of our art department to get an impression of what might be their future workplace. They were shown the facilities, equipment and the library and also took a look at a selection of drafts and graphics. If the idea of working in our art department and joining the team appeals to you, you can find lots of job advertisements on our website. You can send your application to artjobs@goodgamestudios.com. We’d also like to invite you to join us for the next Art Night on February 20th as part of the Social Media Week. You can sign up for it here.